This unit does not have an electronic lock, for your stay you will get your keys from lock box. This spacious second floor condo with three bedrooms, two and half bathrooms, provides accommodations for eight guests. The beds include a King in the Master, a Queen in the guest bedroom, and two twins in the colorful kid's room. Your fully air-conditioned home away-from-home includes a full-size kitchen and dining area, well supplied with dishes and utensils, a dishwasher, microwave, toaster, and coffee maker. 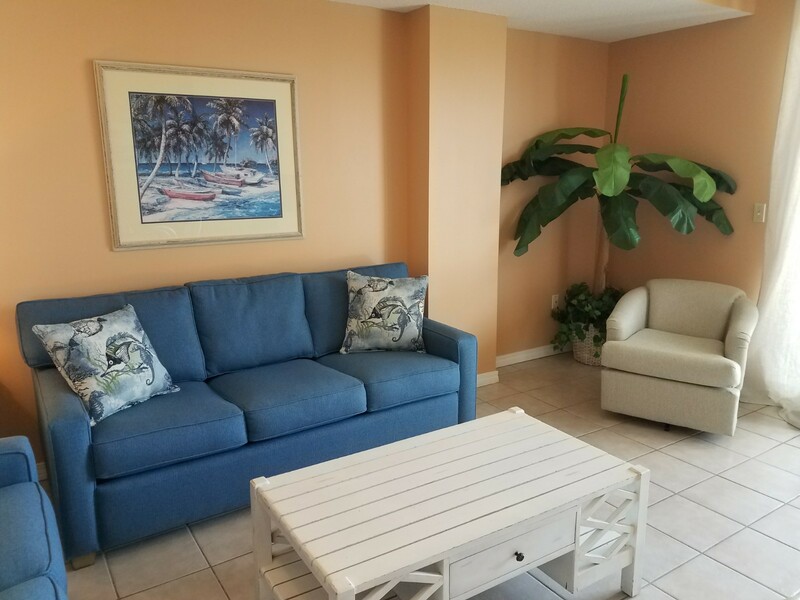 If you would like to enjoy a quiet evening at home, your options include wireless internet, flat screen TV with DVD player, a wrap-around balcony with a great sunset view, or a hot tub located just downstairs by the pool. Located on one of Fort Morgan's most beautiful beaches, the private grounds of The Dunes Community offer 2 pools, 2 hot tubs, an aerobic workout facility and access to the private beach. Nearby, you will find the Historic Fort Morgan, the Fort Morgan Ferry, and fantastic hiking trails. At the Gulf Shores Marina across the street, you can find deep sea fishing charters, kayak, bike, pontoon boat, and Jet Ski rentals, and a full service restaurant (Tack Jacks II). A ten-minute drive will take you to two golf courses (Peninsula or Kiva Dunes), and in just twenty minutes you can enjoy all of the restaurants and shops of "downtown" Gulf Shores. There is truly no better condominium rental in all of Ft. Morgan to enjoy panoramic gulf views. Book your next vacation today! THIS IS A PET FRIENDLY PROPERTY. There is a 25 pound weight limit and only 1 dog is permitted. If you are bringing a dog you must call to book this property. "Clean and mostly quiet. Some building maintenance in progress but it has to be done at some point, understandable. The ONLY issue we were not pleased with is the pool and hot tub area was only opened until 9:00pm and children filled the hot tub every day until 9:00pm I would suggest 9-11pm adults only." "Thank you, Rocky, for the review of your stay in Dunes 209. Unfortunately, we don't manage the pool or the building, so we don't have a say in the pool rules, but that sounds like a great idea!" "Had a blast. Looking forward to doing this again. Was our girls 14th birthday celebration. " "Awesome! Thank you for letting us know and give us a call when you are ready to come back!" 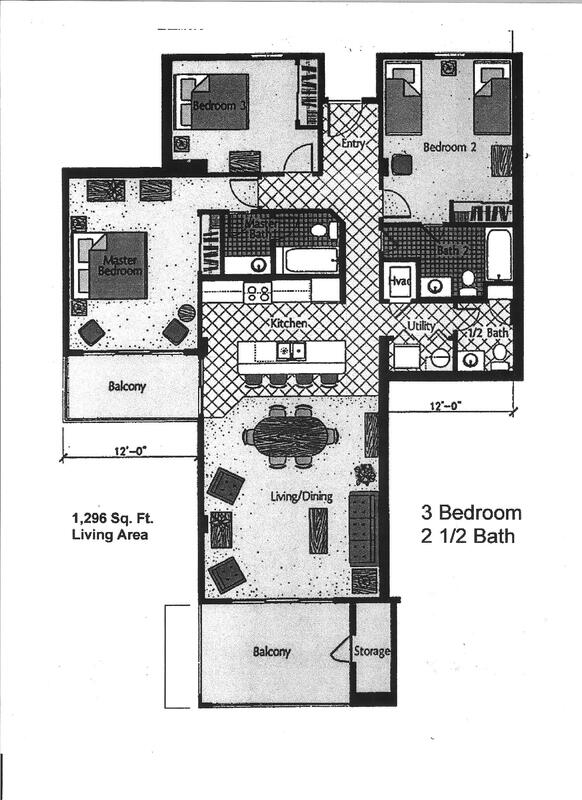 "We loved the location of the condo near the end of Fort Morgan Road. We had leaky faucets that was repaired immediately. No other problems. We enjoyed the ferry rides to Dauphin Island, walking the Gulf and Bay beaches, exploring the Forts. We listened to live music at Sassy Bass resturant. We really enjoyed Sweet Home Alabama!" "That is what we like to hear from our guests! Glad maintenance was quick to respond! Fort Morgan is a bit secluded, but does offer some enjoyable activities! Please come and stay with us again!" "We had a great experience. Loved the almost private beach!" "Yay!!! We are so glad to hear this! We hope to see you again soon!!" "We so enjoyed our stay at the Dunes Condo in Ft. Morgan. There were 6 adults, 2 kids, and a dog, and the size of the rental was perfect! We never felt crowded. We loved the views of the colorful houses on the beach, and the walk to the beach was not bad at all. The only complaint we had was that the pool was shut down for an entire day (on a pretty day too!) for chemical treatment. We were a little sad about that, especially with our little kiddos wanting to go swimming, but it was up and running the next day." "Alicia, we are so very glad you enjoyed your stay with us! Sorry about the pool, sometimes the association does have to close the pool for maintenance, at least they got you up and going the next day! Kids do love the pool!!" "Over all this property was really nice. Was clean and ready on time. Very spacious and our family had plenty of room. Pictures really don't do the property justice. " "Yay!! Thanks for writing a review, we are so glad you were satisfied with your stay here at Ft Morgan!" "We loved Ft. Morgan - our first time staying. We had 6 adults, 2 toddlers and our dog." "Yay!! We are so glad you found us, and we hope you'll get to come back often!" "Dunes 209 was everything that was advertised. Despite a minor refrigerator problem we had a wonderful time. The Sunset Properties staff was great. We checked in after hours but the staff had things arranged perfectly for our late arrival. The actual condo was great. It made for a wonderful family vacation. I would not hesitate to use these facilities again." "Yay!! We are so happy to hear you enjoyed your stay, and certainly glad we could resolve the issue with the fridge quickly!" "We needed a condo for just two nights in July and were happy to find this one available. We liked that it was a smaller complex, which made for easy parking, no elevator wait, and less crowded pool. Check in was super easy. Our unit had a nice view of the gulf. Everything was in working order, with exception of the dryer which took about 4 hours to dry a load of towels. We didn't discover this until the morning we checked out." 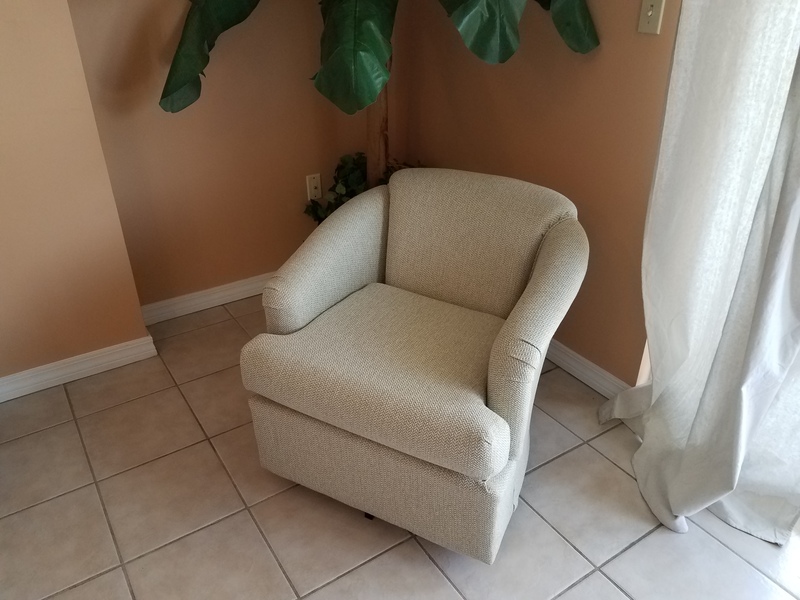 "This was our first time renting a condo for our vacation. Also our first time in Alabama. People are very friendly their.We were very pleased that everything went smoothly . Condo was very clean and spacious. We had a great time , and would definitely like to go back in the future. Thank you Sunset Properties for an enjoyable stay." "Thank you for the review!! We are so glad you had a memorable and warm welcome to our state! We hope you continue renting condos for your accommodations, especially if it is a condo with us:) "
"We love the location and the atmosphere and people can't wait to come back "
"We wished we had stayed longer, the younger boys would have liked to be a little closer to town but all in all, we loved the seclusion. Condo was spacious enough to accommodate all 7 of us. Wish we had brought knives from home as the kitchen knives were very dull and could barely cut anything, and the dryer either needs to be cleaned out or replaced. It would take 3 times of the highest setting to dry a small load of clothes. But the staff was very friendly and helpful. Johnny on the spot too." "Great getaway spot. Enjoyed the 2 balconies on the corner!" "We had a great vacation here. It was a nice room, clean and mostly quiet. It had all the kitchen things we needed, including a blender and a toaster! :) There was space here and there to tuck in our own things, as well, which is helpful. We weren't sure how close we'd be to the beach, but it was only about 1/4 mile, easily walkable. Thank you!" "Yeah!!! So glad you had an awesome time!! Please come back and see us again real soon!!" "We loved staying in the condo. It was a great place and had an awesome view especially for the price. One request I would have is to provide more towels for the bathrooms especially if the stay is more than a few days and numerous people staying." "The weather was perfect for our fall trip to the beach. This was our first stay in the Ft. Morgan area. We loved the beach, dining at Tacky Jacks and will visit again. Thank You!!!" "Thank you for writing a review of your stay in Dunes 209. The beaches in Fort Morgan are always great but Fall is absolutely the best time to visit. Please call or go online to book your next stay with us soon. Sunset Properties Staff"
"Thank you for taking time to review your stay with us in Dunes 209. Glad to hear that you found everything was perfect for your visit and we look forward to booking your next visit soon! Sunset Properties Staff"
"the view from unit 209 was abstracted by trees. Our fridge did not keep food cold, was fixed. The bathtub drains had to be unclogged and the pool was closed to much, otherwise we had a good time"
"Thank you for taking time to review your stay in Dunes condo 209. We hope you will come visit us again and let us show you that there are not always issues. Sunset Properties Staff"
"It was great. Very relaxing. " 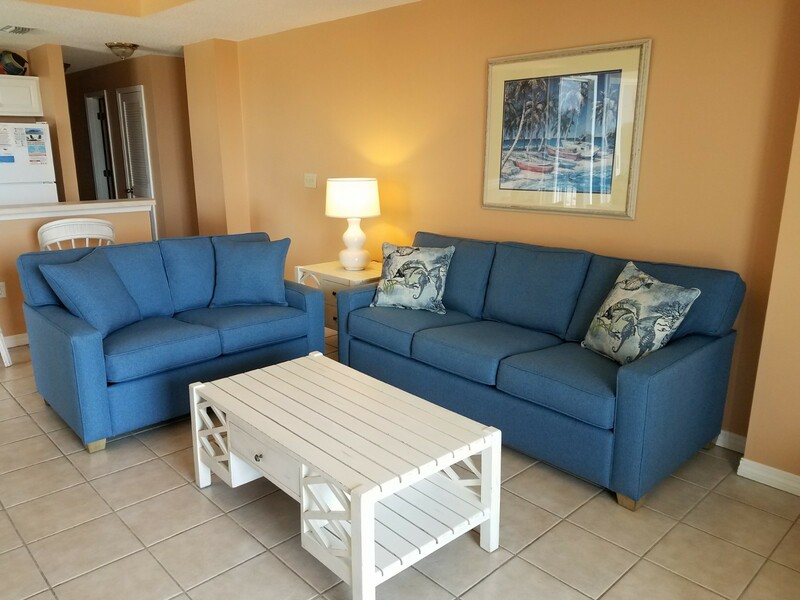 "Thank you for taking time to review your stay with us in Dunes condo 209. A great end unit with great views! A perfect place for a relaxing beach visit. We look forward to booking your next stay with us soon! Sunset Properties Staff"
"We had a great time. Condo was clean and room and comfortable. We had a wonderful view of the beach and gulf. Grounds and pool were well-maintained,"
"We were so pleased with the condo and our stay. It was very clean, decorated beautifully and just what we wanted. We hope to stay here again at a later date. "Thank you for taking time to write a review of you stay with us in Dunes 209. We are glad to hear that everything was perfect for your stay for the wedding and we hope you will call us soon to book your next visit. Sincerely, Sunset Properties Staff"
"Great property! I would like to return." "Thank you for taking time to write a review. We are so happy that you liked the property and that you want to return. Give us a call soon so we can book your next trip! Keep an eye on our website and social media sites for future specials and up coming events in our area. Sincerely, Sunset Properties Staff"
"This is the second year we have stayed here. Love it because it is away from the crowds. Unit 209 was very nice. Great air conditioner. We had a good view especially with the sun going down. The staff at the office were all very nice. A special thanks to Katie for me worrying her with so many emails asking questions before we came. Also was glad we were able to stay 2 extra nights. Overall a very nice place. Will be back here next year if all goes well with us. Thanks again for a wonderful vacation. My 2 year old granddaughter had a great time in the little kiddie pool at the Indies. The only thing I would change is that the pool and hot tub stay open a little later than 9. Not really for me but for my daughter (the younger generation) ha ha!!" "Very pleased with our rental. We will be back next year." "Thank you for taking time to write a review. We are glad to hear you enjoyed your stay and we look forward to booking your next visit with us soon! Sincerely, Sunset Properties Staff"